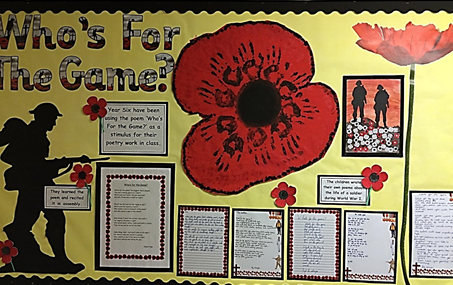 The pupils at Rockmount focussed on poetry and art as part of their Remembrance Day celebrations. All year groups learnt poems about World War 1 and were given the opportunity to write poems of their own. The children also used a variety of mixed media to create wonderful pieces of art work depicting World War 1 scenes. As part of their Remembrance Day celebrations all year groups participated in an assembly where commemorative songs were sung. A brief history of Remembrance Day was also presented and a variety of poems were recited by the children. In addition to this, each child created a poppy. 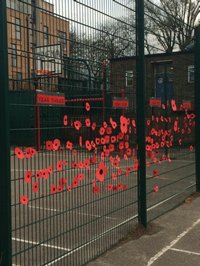 All the poppies were then collected and we were able to display our very own Remembrance Day Memorial installation on the arena in the playground. This highlighted all the hard work and effort the pupils made to mark this auspicious occasion a success. 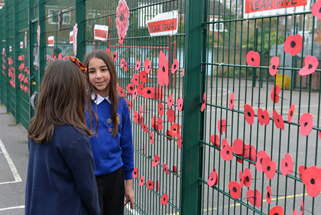 At eleven O clock, on the eleventh of November 2014, all the pupils and staff of Rockmount Primary School held two minutes of silence to show respect for all the fallen soldiers who died during World War One.